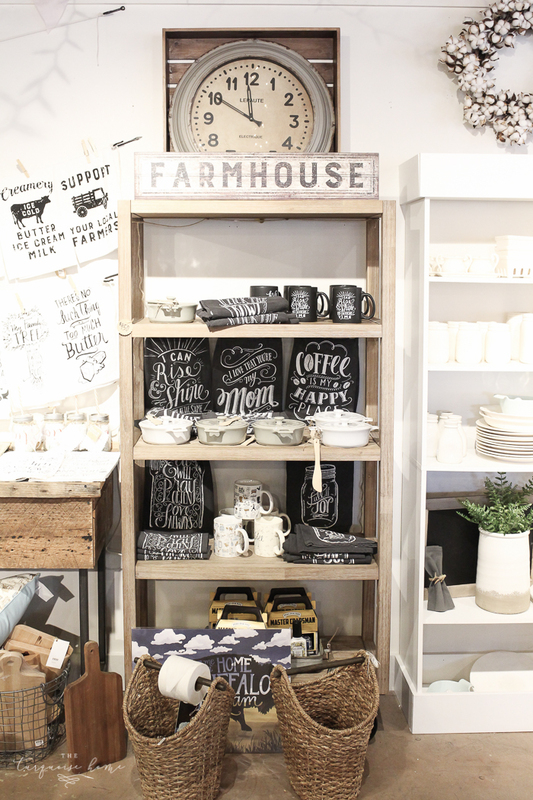 The epitome of farmhouse kitchen style is a utensil that functions as decor, too. It is something that is not only functional, but beautiful. I love a tray or container that isn’t just doing its job, but looks good while doing it. Nothing plain and plastic for me, please! I think this is why farmhouse decor is so popular. I have been on the hunt for some cute farmhouse accessories for my kitchen, because I’ve redone it and added these inexpensive farmhouse shelves that I love to decorate. I also got rid of the red accessories and darker blue walls and brought in this reclaimed wood for the bar and freshened up the space with paint. While shopping in Franklin, Tennessee (my hometown) a few weeks ago, I came across these adorable tea towels. There was a whole wall display of the black on white patterns. And then this display of chalkboard with white lettering was too cute not to snap its picture. I wanted one of every style! Some of the larger items are a little pricier, but everything I’ve listed here is under $100. Whoop! Yay for pretty decor that is affordable! Affiliate links used for your convenience. See my full disclosure policy here. Our first floor was destroyed by flood waters from hurricane Harvey. We are now starting the process to rebuild. My question is how hard will it be to go from my old style (Tuscan with reds, golds Greens) to more modern, farmhouse type using light colors with greys, duck egg blue etc???? We lost everything on that floor including all lower cabinets, flooring, plantation shutters, furniture and rugs so I’m starting with a clean slate. I’m just scared to take the plunge into something so different!!!! Thanks for any advise you can give me! I THOUGHT you were near/in Franklin! My son, daughter-in-law, and grandsons live there (in West haven, till the end of the month)…then moving closer to the school my grandsons attend (CPA). I absolutely LOVE strolling through the streets (and of course, the shops) of Franklin! In fact, I believe I recognize the “Tin Cottage” in your pics of towels. 🙂 I come down (from Michigan) several times a year…..love to shop while “my boys” are in school! Thank you so much for for making us your Favorite New Shop in Franklin, TN!! We are so honored ☺️💕 . I also grew up southern and in a farming community so the farmhouse style just feels like home to me. And thank you for so much for spotlighting your hometown of Franklin. The community of merchants in Downtown Franklin work so hard to create a special experience for our visitors. Your post was a beautiful testament for us all. LOVE this post!! Thanks for the information..when we move to MI I am planning to use a lot of farmhouse style ( my style is cottage, farmhouse, industrial with coastal colors). I will be using your post to get a few things in advance. I get so many great ideas from you! keep up the good work! I’m so glad you love it, Marianna!! Have fun decorating the new house! !